Died at home, Granard, natural causes. 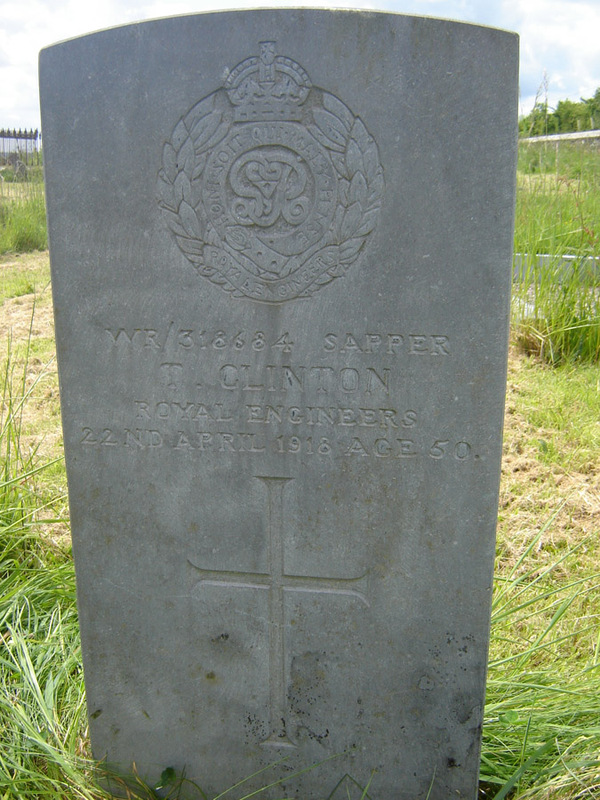 Thomas Clinton was born 18 August 1872** in Maghera, Co. Cavan not far from Granard, but later moved to Creevy, Co. Longford. He married Margaret Carters (or Charters), in Granard in November 1899. Thomas and Maggie had had seven children together, including: John, Maria, Thomas, Elizabeth, Ellen, Joseph, Patrick, Margaret. Thomas appears to have had military connections prior to the Great War, as his wife refers to an earlier Royal Engineers regimental number of 409 (404 on file). Thomas entered the I.W.T. at Longford, in August 1917. and served until December of that year. He appeared to have had an operation at the Granard Union Infirmary for a hernia at that time, but did not heal and the wound became cancerous; he remained in hospital until February 1918, when he was released to his own home, where he died. After his death, his widow appears to have remarried and became Margaret Reilly. *The CWGC states that Thomas's mother was Rose Clinton, however it is likely that she was actually Biddy/Bridget Clinton (née Sheridan), originally from Mahera and later lived in Creevy, and the Commonwealth War Graves Commission (CWGC) entry was an error; Rose was, in fact, his sister. **His birth year was given as 1879 in his 1917 attestment. After Thomas's death, Margaret was living in Parnell Row, Granard.